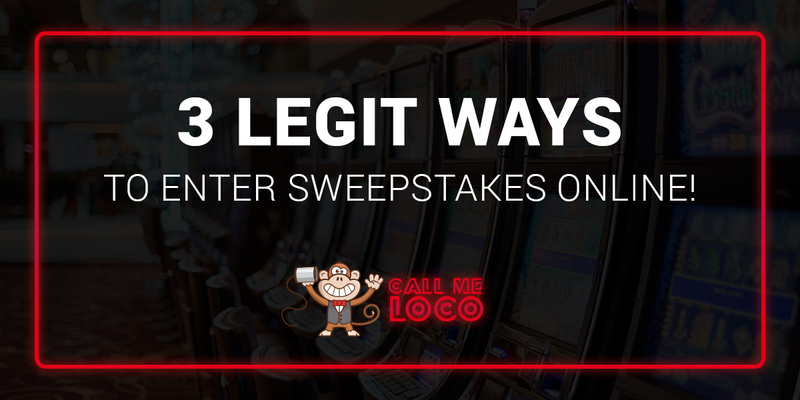 Call Me Loco | 3 Legit Ways To Enter Sweepstakes Online! 3 Legit Ways To Enter Sweepstakes Online! 04 Mar 3 Legit Ways To Enter Sweepstakes Online! Scammers all the way! In the loggia of sweepstakes, people get hitched by the golden offerings. Little they are aware; scammers do it on purpose to hitch the attention of people. There are multiple online scams in the alley to enter sweepstakes online. You need to keep your eyes open so that you don’t get caught in the web of fraud online sweepstakes. Folks put in efforts to convince you that their sweepstakes offering is legitimate. Mostly, online sweepstakes are a hoax; scammers try their level best via telemarketing and golden offerings to grab your attention and ditch you. An authentic sweepstake always has a set of official rules. People are least bothered to pay attention to those rules and just see the golden spoon. Now, it’s the time to pay attention to whether the online sweepstake has a set of well-defined official rules or not. There are multiple ways to enter sweepstakes online that have quite vague rules. Now, just because an online sweepstake has mentioned official rules, it doesn’t speak for the authenticity. The identification of authentic sweepstake is that it has clear official rules, like eligibility criteria, prize details, etc. Right now, there must be waves of question inside your head. Well, you don’t need to stress yourself. We are here to tell you the most legit ways to enter sweepstakes online. Not all sweepstakes directories are authentic, but yes two sweepstake directories “The Balance” and “Online Sweepstake.com” have a list of trustworthy sweepstakes. It offers you the free newsletter and you get to see the listing of authentic sweepstakes. The above two directories are useful and only shows the list of those sweepstakes that have well-defined official rules so that you don’t get trapped in any scam. The way to know whether a sweepstake is authentic or not, see if they ask you for your account number or they ask your credit card information. If they do so, just run away, close that website immediately. The chances are that they will steal the information and you will be in debt afterward. Moreover, many times, scammers shoot you with emails that contain lots of grammatical errors or spelling mistakes. You can quickly spot the poor spelling and grammatical mistakes. If you get such a mail, just turn the deaf ears; as a legit sweepstake will never shoot you with fishy emails. The best way to enter into an online sweepstake is via different promotions being offered by brands. Many companies offer you a chance of winning a sweepstake when you purchase their product or service. Like, there is an ongoing fantastic offer of “Call me loco – Best online sweepstakes for money.” It is offering you a chance to win sweepstake when you purchase airtime from them. Such a deal cannot be missed, Grab it before the deal ends!